My dear friend is giving me a sort of heads up before we start our adventure. 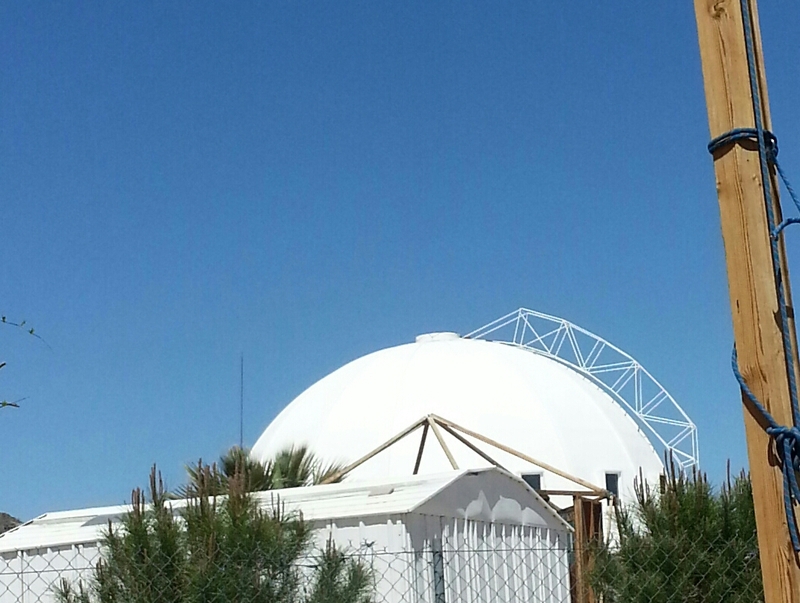 We stand squinting in the late morning sun staring at a huge white dome, bold against a brilliant blue desert sky. I don’t know what to expect. In light of that feeling, I attempt to let go of expectation and simply enjoy the moment of not knowing. I find that approach tends to leave me more receptive to the experience. Besides, I am about to take a bath. Awesome. I have some time before tones familiar to my soul will wash over me, soaking my senses. I figure I should take this time to prepare. Time to relax. The hammock garden is coaxing me over with its canvas multi-color striped bananas suspended for my delight. 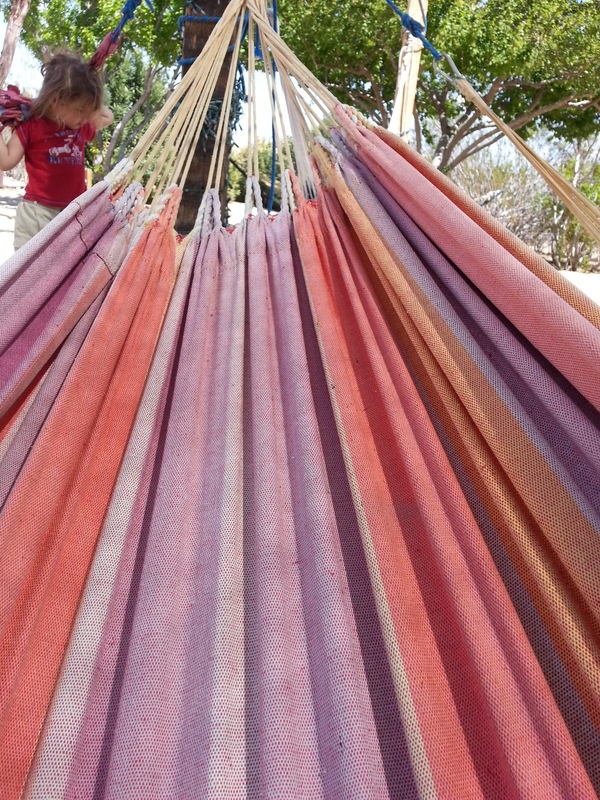 There is an unwritten freedom about a hammock. With no sturdy foundation or solid ceiling fastened rod, the light suspension allows for a womb like experience of buoyancy. Yup. This will do nicely. If I never make it into the upper level of the dome, where the acoustics are so perfect that I can confuse my internal voice from that of the man’s across the room, I will have achieved something. Already, I can feel the calming nature of the location working its healing magic. Slowly I let the idea of probability float away on cactus breezes. In return I am filled with the possibilities of the childlike perspectives from my youth. Ah, to freely dream again, unencumbered by the adult worries of cause and effect. Expansion. Perhaps that is what this whole undertaking is about. At first I was full of thoughts. It could have been creosote currents that carried them away, or I could have just been too tired to continue thinking. Desert vegetation or sheer exhaustion aside, my mind was resting. I was only aware of the warmth of the sun, the desert whispering in my ear, and the weight of my body cradled above the ground. I had no desire to want to stay in the moment. It hadn’t occurred to me. I was IN the moment. That was all that mattered. With no sense of urgency I noticed people making their way towards the bath. I suppose it is time to roll out of my sanctuary. I am usually awkward but not this morning. As I join my friend I become aware that I have been smiling. Is this what it means to smile from one’s liver? To be so content with one’s existence that smiling is as consistent as breathing? Just before I reach the entrance to my purpose for being here, I become aware of something else. I am six again. Maybe it is eight. I am trying to place the age until I understand that the exact age is irrelevant. What is important is being aware of how I see my environment around me. I see it through the eyes of a very young me. I feel it. I feel the moment with all of the magic and wonder of a child. I am receptive to my thoughts in a way that I had long since forgotten. My life didn’t feel like a challenge to be plodded through. Life is an adventure to be embraced with the joy of discovery. All of this abundance of positive emotion without having my body washed over with the perfect tones emanating from quartz bowls. It will keep. This isn’t for everyone you know but, it is for me. 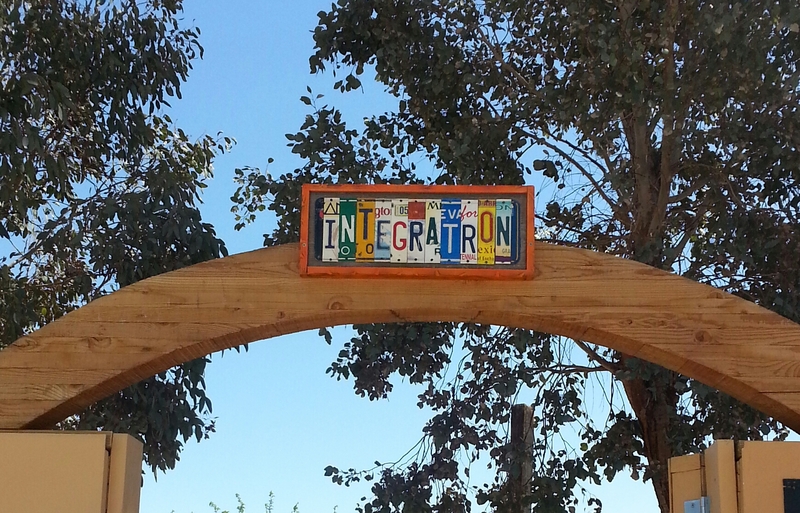 I wish everyone to find their Integratron, a place that puts them in positive tune with their heart. This post is dedicated to my dear friend Deb with all of my love and gratitude.